This webinar is an essential tool for anyone wanting to learn the craft of editing. (As one participate wrote, “This stuff is GOLD!”) Whether you are a new editor, or an old hand looking to pick up new tips, this seminar can help you bring your stories to life. Techniques to improve your storytelling skills. Each week, Larry Jordan presents a live, online, training webinar discussing issues related to video post-production; often focused on Apple Final Cut applications. For a list of upcoming webinars, click here. Important note: After you complete the store checkout process, you will see a Download Link on the Order Confirmation page. This link will allow you to download the product to your computer. You are given two attempts and 10 days to download the file. Since this is a downloadable product, there will not be a CD/DVD mailed to you. 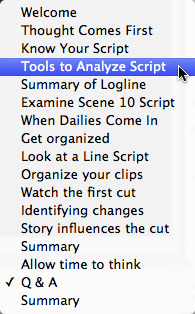 Guest Host Norman Hollyn, presents this fascinating look at the process of how to edit a dramatic film. As the head of the Editing Track at the USC Film School, Norman combines his years of teaching with his professional credentials as both a picture and music editor for feature films into this stunning presentation. Norman will be the first to say that he is not focused on technology. He focuses on the story and how to bring that story into the edit. Because of this, his presentation will be valuable to anyone looking to improve their story telling skills. 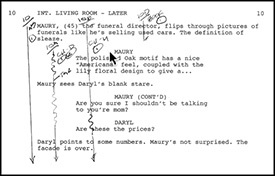 He begins by explaining how to read a script, how to find key emotional changes, called “Lean Forward Moments,” in each scene, how to determine what is important in each scene, and how to describe the script in terms of what changes in the story. He next moves into Final Cut Pro – though, in fact, any editing software could be used – and shows how he organizes his clips and plans his edit. He illustrates a sample cut of a scene and explains his thinking on why he selected each shot and how they all fit together. No prior knowledge of any software is necessary to view, or understand, this tutorial. This tutorial looks at story-telling and aesthetics, not technology. To quickly find the information you need, we added chapter markers for easy navigation. Why it is important to take time to think. Questions and answers from the audience.